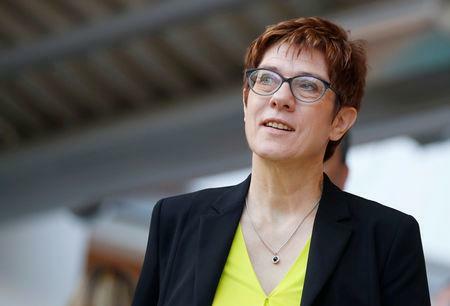 BERLIN (Reuters) - German conservative leader Annegret Kramp-Karrenbauer said on Wednesday that suspending Hungary's Fidesz party from the EU's centre-right political group would be a good option until trust was rebuilt with Prime Minister Viktor Orban. 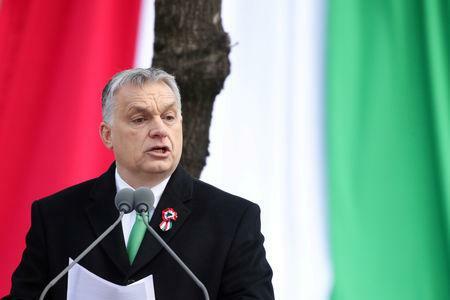 The European People's Party (EPP) meet on Wednesday to decide what action to take against Orban's Fidesz after a row between the mainstream group which accuses the populist, anti-immigrant Orban of flouting the rule of law. Some delegates want to exclude Fidesz altogether. "As long as Fidesz does not fully restore trust there cannot be normal full membership," Kramp-Karrenbauer, a confidante of German Chancellor Angela Merkel, told Reuters on Wednesday. A membership "freeze" would be an option, the leader of Germany's Christian Democrats (CDU) said. Fidesz angered the EPP by distributing posters of European Commission head Jean-Claude Juncker depicted as a puppet manipulated by billionaire George Soros into backing uncontrolled immigration into Hungary. Orban has also campaigned against the private Central European University in Budapest founded by Soros. Earlier this month, Orban apologised for offensive language but some EPP leaders said was not enough. Kramp-Karrenbauer said Orban had taken some first steps to show that it made sense to continue a dialogue. "But it is not enough to put doubts to rest about whether Fidesz shares an understanding of the common values of the EPP that would enable a future cooperation based on trust," she said. Juncker told German radio on Wednesday that he advised the centre-right EPP bloc to kick out Fidesz.